After winter break in July, we are now starting another semester at the Seminary with 4 new students. We are also offering a lay leadership course in family counseling that has 30 students in the classroom and 50 students watching on-line in our virtual classroom! Our evangelism class this semester is being taught by 4 church planters from our state. While we’ve had 2 professors teaching before the same class before, we’ve never had a team of professors yet so we are excited for the richness this will bring to our students’ overall education. In July I had a rare opportunity to train 26 teachers in a public school here in Porto Alegre, Brazil. My prayer for this time of training was that God would give me wisdom to teach something valuable to these teachers and that it would open the door for other oppor-tunities in the future! Based on the feedback, God answered both of these prayers. 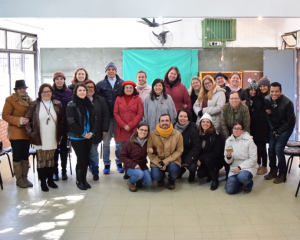 The principal asked if I would be willing to come back and do more training and the vice principal asked if I would be willing to do some training with other principals and vice principals in Porto Alegre. I said yes! While no dates have been set, I am very grateful for this opportunity to bring biblical principles into the public school setting. Paulo and I continue to love our new church family! We have seen spiritual growth and growth in numbers in our congregation. We are blessed to have as members 2 Seminary graduates – one being a former student of mine; a current seminary student, and 2 pastors besides Paulo. One of these pastors runs a Drug/Alcohol Rehabilitation Centre. This pastor’s wife, Luciana, just had surgery to remove a cancerous tumor and will now undergo chemotherapy. She almost died of cancer last year and more tumors have started to appear again. A HUGE THANKS FOR YOUR PRAYERS AND SUPPORT!